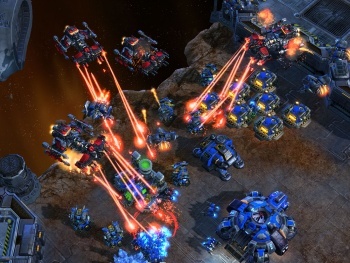 The StarCraft II trilogy was developed to add more fun to the game, not for profit, according to Blizzard. When Blizzard first announced that StarCraft II was going to be divided into three games, each with a campaign focusing on a single race, fans took it to mean that they were going to have to pay three times for a single game. In a recent interview with Game Informer, StarCraft II lead designer Dustin Browder details Blizzard's thought process behind the division, and assures gamers that they're better off with a trilogy than a single title. Browder revealed that Blizzard decided to divide StarCraft II into three parts in the "middle of development," and that it "was not the opening move." As Blizzard kept wanting to add more and more depth to StarCraft II, creating one game simply wasn't an option. "At one point we had 17 or 18 missions per campaign, so we were looking at making 50-some missions," Browder said. "Even then, they didn't have a lot of choice and options in them. The critical path was still fairly linear, and we wanted more missions than that." For Blizzard to put out the product of the quality it wanted, more content was necessary, but that would have been setting Blizzard up for "a 10 or 12-year development cycle." After what Browder calls "hard talks" and "the screaming and throwing of things," the decision to create a trilogy was made. Browder admits: "It still took us forever," and though he believes fans are getting plenty of value out of the StarCraft II games, he does feel for the fans that only have interest in the Zerg and Protoss campaigns that'll have to wait. Still, he reveals: "We were looking at maybe a 12-mission campaign for each race ... [that] wasn't going to be as fun." And we may be getting even more content in StarCraft II: Heart of the Swarm - the upcoming Zerg-focused title - than there was in Wings of Liberty, with Browder saying it'll possibly have "a larger campaign, with more details on Kerrigan, [and] a more in-depth look at what it means to be a Zerg." Sounds good to me. So can we please all stop saying that we're paying three times for one game now?